I think the biggest change in fly fishing over the past 20 years has been the willingness of fly anglers to step outside the boundaries of traditional fly fishing venues. Casting a fly to a largemouth bass or carp is becoming more common place and accepted by the fly fishing community. We are becoming a much more diverse group in terms of the fish we pursue and this is a very good change. Fly fishing has a reputation as an “old guy” sport. However, for fly fishing to move forward we need to get younger, step over the boarders, jump into some new water feet first and try something new and different: Fly fishing mako sharks. So, I present to you: Mako Sharks on the fly. 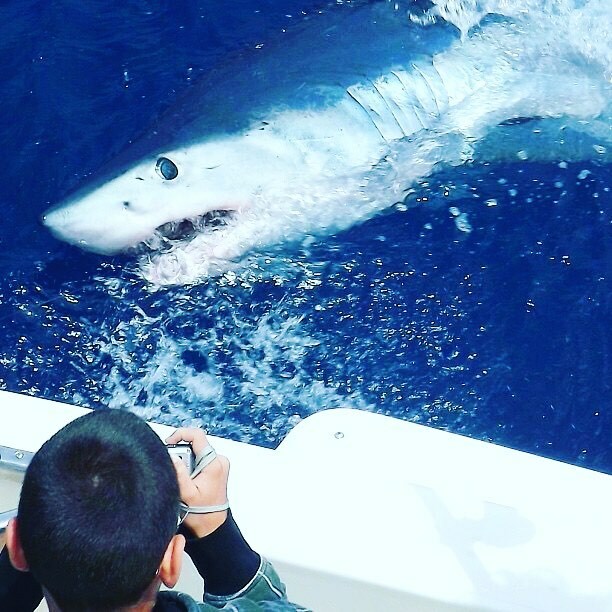 I’m sure some of you have heard of catching mako sharks on the fly off the Southern California coast. This is a unique fishery, one that a fly angler can sight fish to a very large, acrobatic gamefish without having to spend a fortune and travel halfway around the globe. Why fly fishing mako shark? I’ve been fortunate to have been able to travel around the world targeting large big game saltwater species on the fly over the past 20-plus years. But, Southern California is the place I continue to return to each summer to present a fly to one of the fiercest, strongest, fastest and most acrobatic gamefish in the world: the shortfin mako shark. 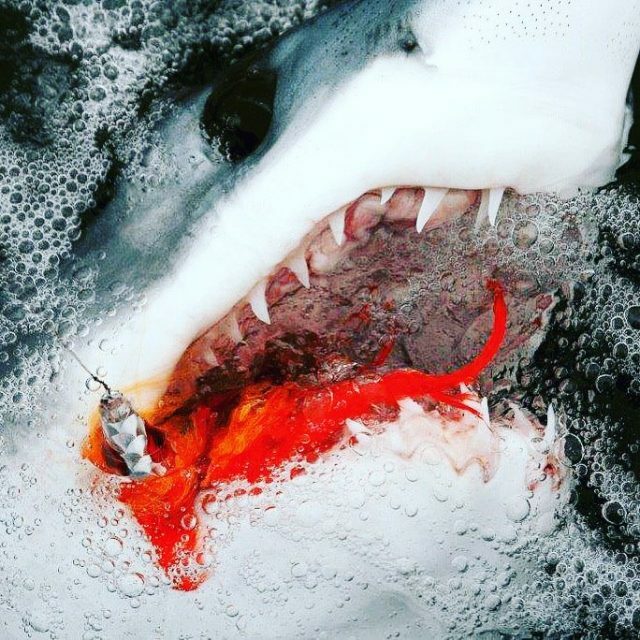 Honestly, there is no other saltwater gamefish that takes a fly as easily as the mako shark. And for fly anglers who are looking to jump into the saltwater game, there is no better gamefish to hone your big game mako shark fly fishing skills. 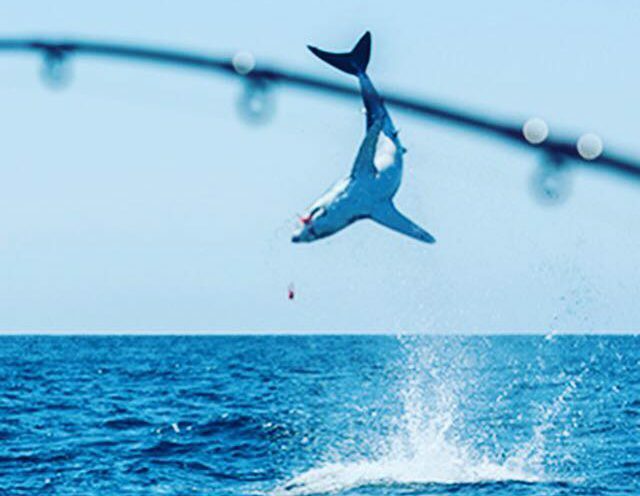 To watch a mako shark hit a large topwater popper on the surface, make a blistering run while jumping 10 to 15 feet out of the water into the air is like nothing else in saltwater fishing. 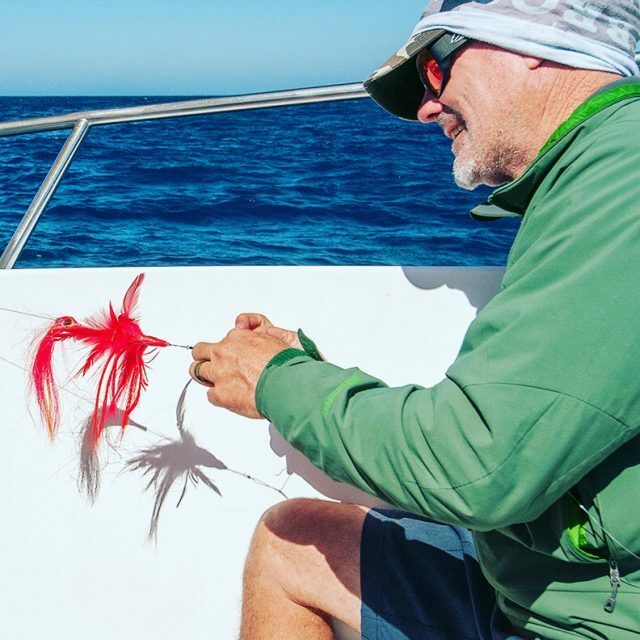 The first thing you need to understand to be successful at fly fishing mako sharks is where and when the makos show up off the Southern California coast. Of course you can find makos in our local waters year round, however the true mako season runs April thru October. When the water begins to warm up from the mid to high 50’s and start moving into the low to mid 60’s is typically an indication that makos will be showing in our local waters. Another indicator when mako sharks will start showing up in our local water is the presence of large food items like tuna. When tuna are around makos will most definitely be there. I believe the reason we are seeing more makos year-round in our local waters in recent years is because of the presence of bluefin tuna. Remember, if the food item is present then the large predators like makos will be less apt to leave an area. So, once we know the makos are here how do we find them? There are three factors I use to locate makos during the season: structure, tide cycle and food items. Makos are pelagic creatures, even though a vast majority of the makos will stay in a” general” area during the fishing season. However, “general area” is a relative term and relates to the area known as The Southern California Bight. A vast piece of water that stretches from Anacapa Island to the Mexican border, 100 plus miles offshore. Underwater offshore banks are a good place to start looking for makos. These areas have great upwelling and create lots of current which attract all sorts of baitfish and larger food items for mako sharks. Some of these banks can be as close as just a few miles offshore, perfect for the fly anger who has a smaller skiff or is not comfortable running to the offshore banks. Tide Cycle is a key component in locating productive area for mako sharks. Greater tide movement creates stronger currents which will flow over offshore structure, creating offshore rivers called current breaks. I believe, these breaks are used by makos to travel from one location to another utilizing the flow of the current to conserve energy. These currents also tightly stack bait and other food items along the offshore structure making it easier for a mako to find prey. Mako sharks are a high functioning, fast swimming “warm-blooded” killing machine. So, they need to eat a lot! Finding a suitable food item is key in locating makos. Tuna, swordfish, seals and porpoise are all primary food items for larger makos sharks. However, for smaller mako sharks, 40 to 200-pound range, bonito, barracuda and yellowtail are the mako’s primary target. 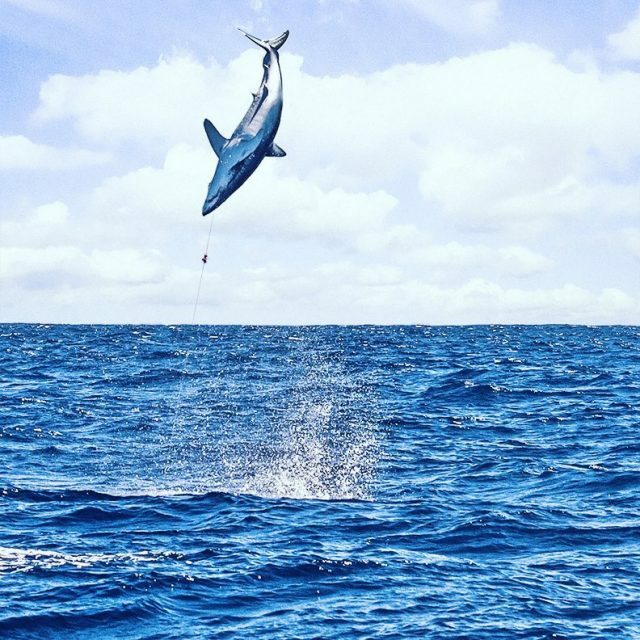 These fish are abundant in our local waters during mako shark season. Ok, so we know the three factors: structure, tide cycle and food item. Now what? It’s time to set up a chum slick. 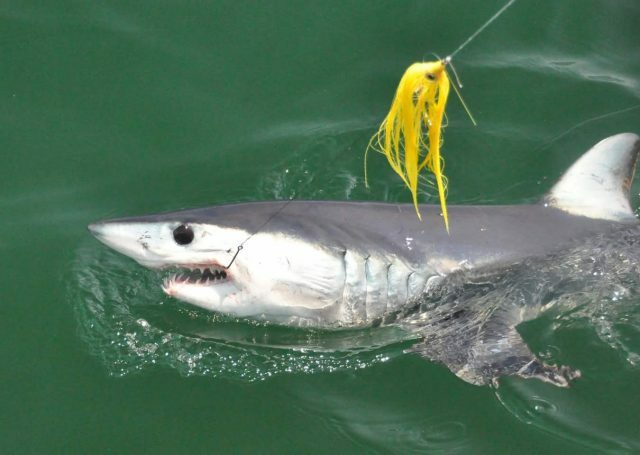 Chumming is the most effective way to get a mako shark within casting range for the fly angler. Chumming also makes it possible for the angler to cover large areas of water by setting a chum slick and drifting along drop-offs, underwater structure lines, canyons and sea mounts. The most effective chum slick is the one that covers the most water over the longest period of time. 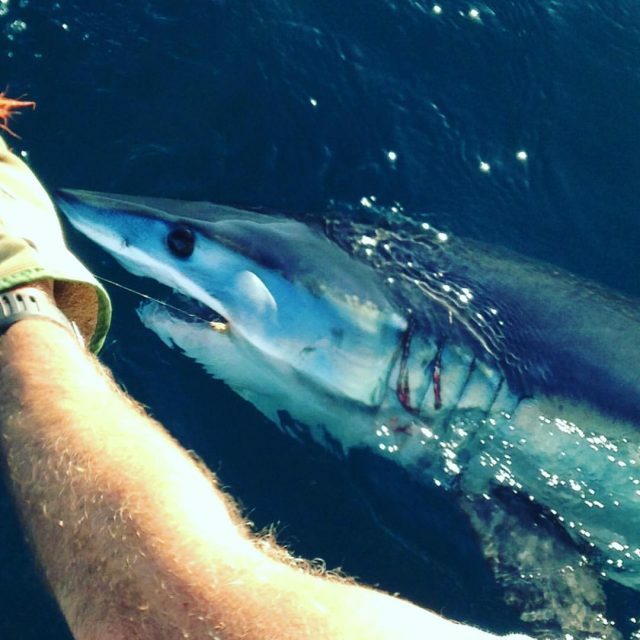 What type of chum is best for fly fishing mako sharks? We are lucky here is Southern California when it comes to buying pre-made chum for sharks. Most local marinas sell pre-ground chum in quantities of 1 to 5-gallon buckets or 5-gallon bucket refills. The chum content is usually a mix of ground sardine and mackerel. The question is “how much chum I should use?” Typically, a 5-gallon bucket fully frozen (you need to keep it frozen) will last 6 to 8 hours depending on the water temp and how many holes you place in the bucket (holes are drilled into the bucket to help purge the chum while it floats behind the boat and slowly thaws). I use two buckets over the course of a 10-hour fishing day. Instead of drilling holes into the sides of the bucket, I drill four 1/4″ holes, one in each corner of the lid. This system works great because once it’s tied off to my mid ship boat cleat, it slowly feeds the chum through the top of the bucket and naturally purges the chum into the water each time the bucket bounces with the waters wave action. Before setting your slick, look and see how the current is flowing. Use your chart plotter to determine the direction your skiff is being pushed. A strong fast current that covers lots of water is ideal. Remember, the key to chumming is covering lots of water over a long period of time. The most important part of chumming while fly fishing mako sharks is being patient. Many anglers when chumming for makos move to a different spot when they aren’t seeing sharks within a couple of hours. I recommend waiting a minimum of 3 hours before considering a move to a different area. Remember, covering the maximum amount of water over the longest period of time is the key to attracting mako sharks. 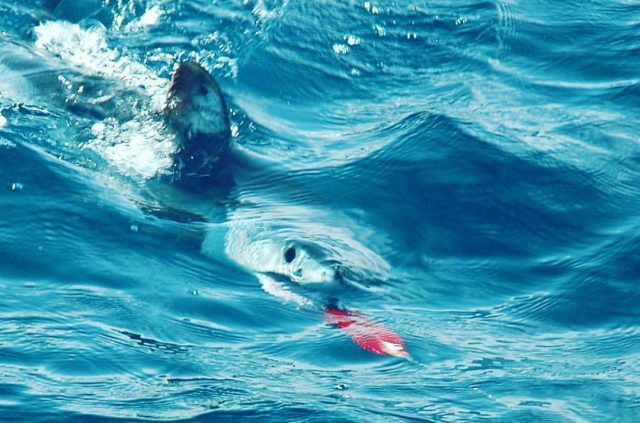 There are very few moments in fishing, if any, where you feel like you’re the prey and not the predator: fly fishing mako sharks is one of those moments. There is no other gamefish I’ve fished for that fearlessly swims up to the boat, eyeballs the angler and proceeds to attack the outboard motor for no apparent reason. It can be pretty intimidating. When the boss shows up stay calm, cool and collected. In many saltwater fly fishing situations, a long cast (over 40-feet) is common. However, when fly fishing mako sharks the cast can be as short as 10-feet. Makos usually don’t get spooked by the sight of the boat or an angler casting the fly at them. Remember, when a mako shows up at the boat they are usually in attack and kill mode, so a bad cast or noise does not bother them. Fly placement is more important than distance. Making a good cast at a 90-degree angle in front of the mako’s nose is what the angler should try to do each time. Also, lead the shark by 10-feet, meaning place the fly 10-feet in front of the shark’s nose. This will ensure the shark will see the fly and be able to move in the direction of the fly to eat it. Once the mako shark has honed in on the fly, all the angler has to do is move the fly by stripping it or sweeping the rod tip to the left or right, making the fly move swiftly through the water. I like to use a foam popper head to create a large wake in from of the fly. This extra noise and commotion will initiate a more aggressive strike. When fly fishing mako sharks I always suggest to set the hook as hard as you can and anyway possible. The traditional strip strike used is most saltwater fly fishing in not necessary for hooking a mako shark on the fly. 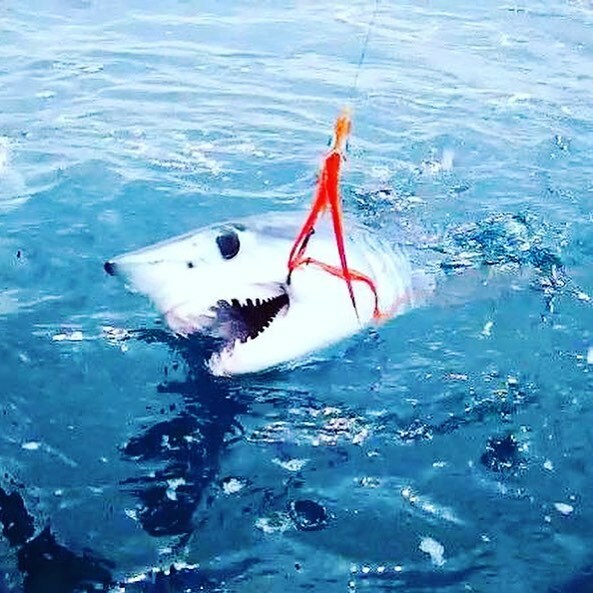 You want to lodge the hook in the corner of the mako’s mouth with maximum force with the hope that the mako will quickly swim away from the boat after being hooked. I’ve hooked many mako sharks that don’t swim away from the boat after being hooked. These sharks are very dangerous because they can jump into the boat at any moment. Believe me, you do not want a mako shark, of any size, in your boat. So, a strong hookset will help in getting the mako to swim away from the boat. The key to fighting a mako shark with light tackle is keeping a low rod angle and applying maximum pressure at all times during the fight. Once the mako makes the first couple of runs and jumps, it will settle down and swim close to the surface. This is the time to really apply the pressure. If the shark gets time to rest it will regain its energy and it could take much longer to get it to the boat. Always be prepared for a fight that could last a long time (30 to 60 min) or more. Another key to fighting makos is always keeping your shoulders square to the fish and to have no more than a 90-degree or lower rod angle at all times during the fight. You will have more control over the fish and will be able to fight the fish more efficiently. Once the mako is boat side and ready for release, it’s very important that you strip off 10 feet of line from the fly reel and be prepared for the mako to make one more run. Typically, when boat side, the mako will sound. It’s important to point the entire rod vertically into the water, keeping tension of the line. Once the shark stops sounding (which may or may not happen) then begin to short stroke the fish back to the surface. 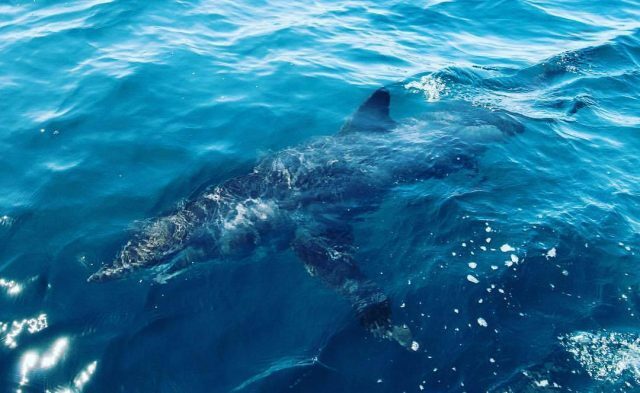 Releasing a mako shark is not for the meek! It’s as up close and personal as you’ll ever get to a dangerous predator. However, if you’re careful, releasing a mako can be quick and painless for both you and the shark. The biggest keys are using a barbless hook and having a proper release stick. The release stick should be at least 4-feet in length and have an open-ended U-shaped stainless-steel tip (see picture). This U-shaped tip is inserted into the corner of the shark’s mouth at the gape of the hook while the release stick is pushed forward keeping tension on the leader at all times. Sounds difficult but once you do it a couple times it becomes second nature. Mako sharks are a valuable resource not only for guys like me who guide for them but also for the health of the ocean environment. They are apex predators that keep the balance of the ocean in check. Even though mako sharks are good to eat, I choose to catch and release all the mako sharks I catch and always will. Now, I’m not saying don’t keep a mako shark, but practice “reasonable harvest” when keeping any apex predator such as mako sharks. I strongly believe we as a fishing community have a big responsibility to pass this great fishery on to the next generation of fishermen. Stay tuned for Part 2 where Conway will break down the tackle required to play this game. 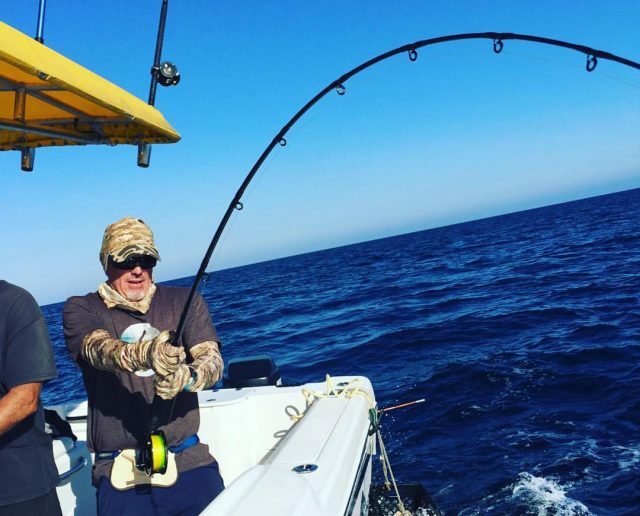 You can follow and contact Conway Bowman for a mako charter on his website or Facebook.